Re Kondogbia - Damn... I really wanted him but couldn't get them down to below 30m! Everyone else in the league is drawing as much as me! Salzburg need to beat Leverkusen, and us to beat CSKA. @Ty: Looks like you've come the closest to replicating the current real life Arsenal with all those draws. Yeah, we just haven't been able to put the ball in the net. 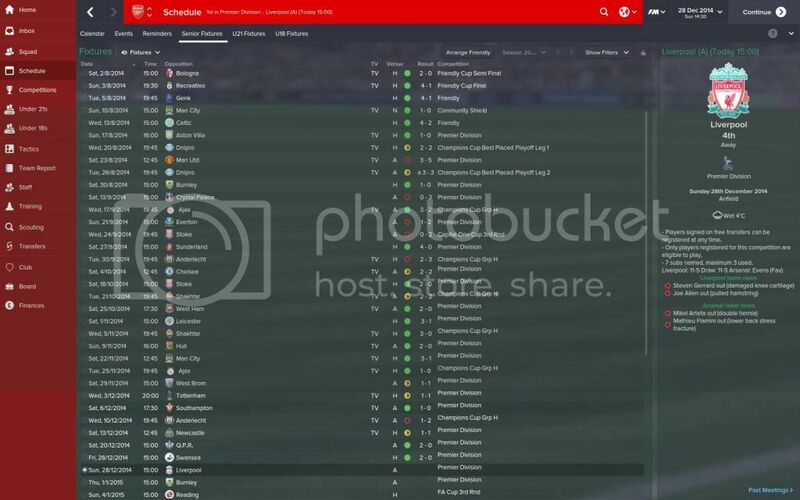 Just smashed Sunderland 6-1, so hoping that is the start of things to come after a couple weeks attacking training. League is a lot closer so far, due to me beating Chelsea on the opening day of the season and sending them on a bad run of form Currently second with Liverpool top by 1 point, City and Utd joint third and only 3 points behind, with Chelsea in fifth on 47! To begin, I should state that I disable first transfer window budgets to add another level of realism. Clubs, including myself, would have to manage the first half of the season with the squads that they decided to go in with. Secondly, I should also add that I implemented Olivier Giroud's injury which he picked up during the real-life season versus Everton. All-in-all, a very productive pre-season. It enabled us to familiarise ourselves with two different tactics, familiarise ourselves to new teammates and to establish a base fitness for the forthcoming season. There were quite a few standout performers, notably Kieran Gibbs, Danny Welbeck and Héctor Bellerín. One aspect of pre-season which encouraged me most was the ease in which youth players - Bellerín, Akpom, Hayden, Zelalem and the impressive Maitland-Niles - all performed with great composure and maturity, which bodes well for their inclusion in the future. One downfall, though, was the injury Alexis Sánchez picked up in the first game of pre-season, straight after coming on as a substitute to score twice: a small knee cartilage tear. It meant that he missed the entirety of pre-season and posed a few problems playing him during the actual season. Our problem in this particular match was that we couldn't substantiate a lead. Two debut goals for Danny - the first a good near-post header from a Mesut Özil cross; the second a composed finish having touched down Oxlade-Chamberlain's whipped ball in - were ruled out, practically, instantaneously by both Agüero and the enigmatic Yaya Touré. Thereafter, we didn't really create much and eventually lost the lead to a near-post set-piece header from Matija Nastasić. provided a deserved lead; Flamini's back-post header from a Cazorla cross consolidated it, but it was the defensive performance late on, following the home side's goal, which showcased fantastic character and determination. A surprisingly routine progression into the group stage. Two excellent performances away from home and at the Emirates. I particularly enjoyed Héctor Bellerín's goal, after coming on to help Mathieu Debuchy on the right-hand side, which saw the talented Spaniard dribble passed two, get into the box and smash one into the roof of the net. A fine first Arsenal goal for Héctor! 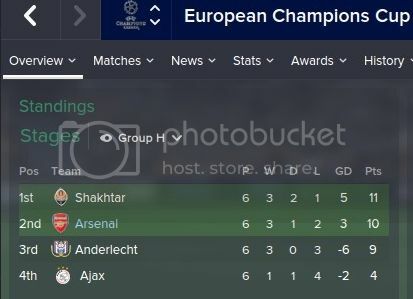 Quite the topsy-turvy UEFA Champions League campaign so far. CSKA Moscow have been the real surprise, topping the table having lost just once; they beat Sporting CP by seven goals to nil on matchday one. 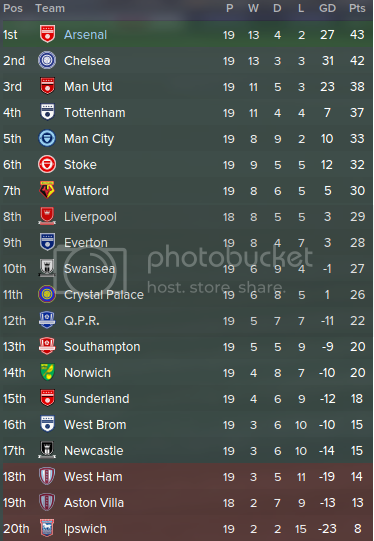 I'm confident of progression into the last sixteen, despite having to rely on CSKA dropping points at some point. Mesut Özil has been, by some way, our best performer - scoring goals, making assists and controlling games fantastically well. Our second visit to Stamford Bridge this season didn't end so well, sadly, but our younger players performer valiantly. A largely second-string side fell first to a well-struck Branislav Ivanović - the second goal from a Serbian defender we've conceded this season - but regained focus swiftly to draw level at half-time, through Alexis Sánchez's penalty, after Héctor Bellerín was fouled in the box. It took a wonderful goal from John Mikel Obi, in injury time, to clinch Chelsea's win. I'm not that disappointed - crucially, neither are the board. There are two well-known weak points in Arsenal's squad: defensive midfield and centre-back. Needless to say, I've already begun taking steps in order to strengthen my squad in said areas. The board have given me £35 million to spend in January. Firstly, I should inform you that Francis Coquelin will join Stade Rennais in January for £2.2 million; Serge Gnabry has also joined Norwich City on loan until the end of November, to aid with his rehabilitation from a knee injury. Centre-back: I deem this the position in most urgent need of reinforcement. So far, I've yet to decide whether I would be best served signing a long-term centre-back to replace Laurent Koscielny or to sign an older, more experienced centre-back who would immediately bring more to my squad. Sokratis Papastathopoulos, Benedikt Höwedes - of Borussia Dortmund and FC Schalke respectively - both feature high on my list, as do Aymeric Laporte (Athletic Bilbao), Samuel Umtiti (Olympique Lyonnais) and Joe Gomez (Charlton). I am also scouting various other options - e.g Rubén Vezo, Kostas Manolas and Antonio Rüdiger - which may force me to change my mind. I will be adding a centre-back in the January window. Defensive midfield: Replacing Mikel Arteta is another task which by no means is easy. 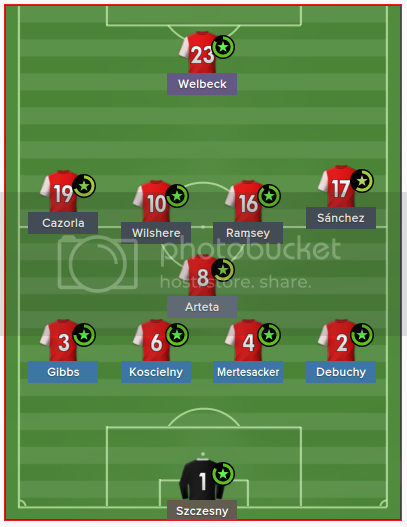 Arteta plays a pivotal role in my eleven and, therefore, requires a player of class to replace him sufficiently. As of this moment, I have five leading candidates: William Carvalho, Morgan Schneiderlin, Christoph Kramer, Rubén Neves and Sergi Samper. I deem all to be good enough to replace Arteta, even the latter two, who are still yet to reach 20 years-of-age. In all likelihood, I will address said position in the summer transfer window. Managed to score more goals, but still slugging behind Chelsea. Opened a nice little gap from the Manchester clubs though. Arsenal need a clinical goalscorer, every game I have played... whoever has been upfront, whether it be Welbeck/Theo/Sanchez/Giroud (5 times), nobody is clinical enough. 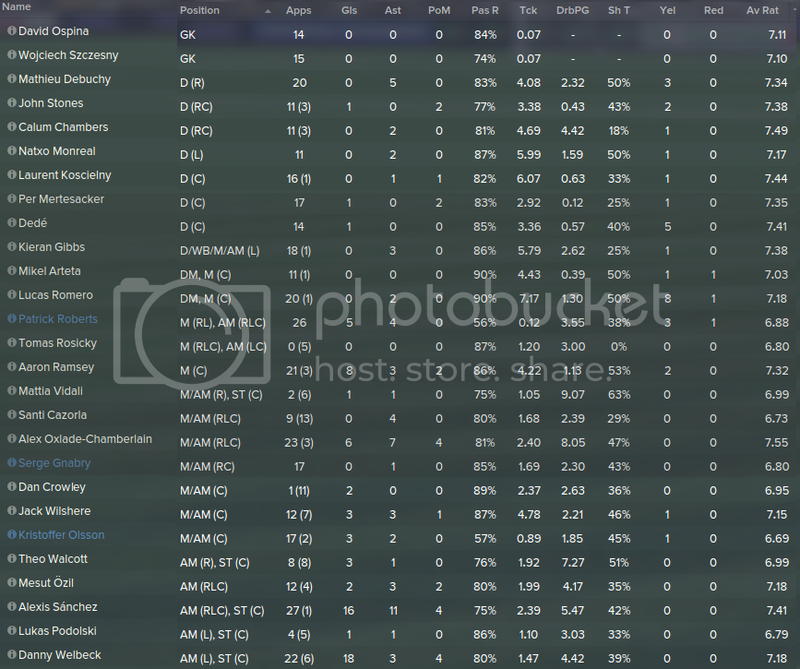 4th top scorer in the league is Jack Wilshere he has been superb, even the top average rated player in the league. His partnership with Ramsey is beautiful. 4 games left in the league, and into the semi finals of the champions league against Real Madrid, eep! Arsenal need a clinical goalscorer, every game I have played... whoever has been upfront, whether it be Welbeck/Theo/Sanchez/Giroud (5 times), nobody is clinical enough. This is really frustrating. I feel the second season budget will be going on this. Just had my best EVER youth intake on any FM ever? None of them are world beaters that you find in the regen thread, but they all have that 4/5 star potential (judged by 20/20 Favini)... and all have the right attributes in the right place. This could be amazing! Missing many 1 v 1s for me, his lack of composure is so obvious in the match engine. It was very gutting was pushing for an equaliser and that happened. 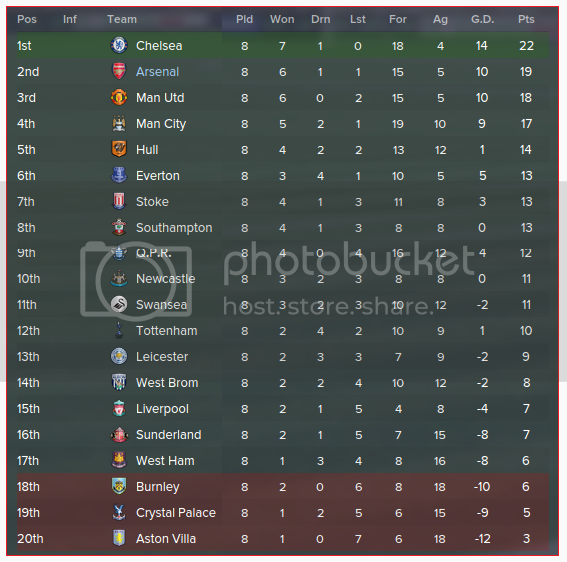 In other news though, just made the FA Cup final and top of the table with a couple games left. Very pleased with the season regardless only disappointments are Ozil/Sanchez, haven't really set the world on fire, but I have kind of shoe horned Ozil in the team at LW. Tough luck there, Ty. I lost the final in my save to an extra-time goal; it's the worst feeling in the world. Have you tried playing Ozil on the right hand side? I tried him as a Wide Midfielder (Attack) on the left of a 4-4-2 and it didn't quite work, but switching him over to the other side has seen him far more involved in games as of late. 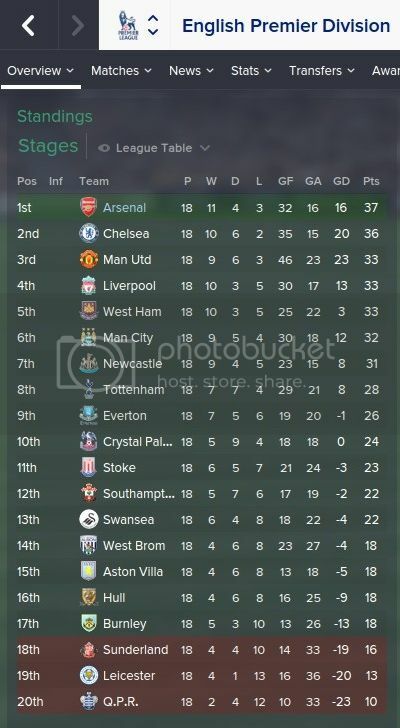 I also was 2 points clear at the top with 3 games left, I then went on to lose to Everton and West Brom.... finishing 2nd completely threw away the league. Plus side; I did win the FA Cup. Ah the pain and misery of throwing it away! Now the season is over, painful losing the league like that. 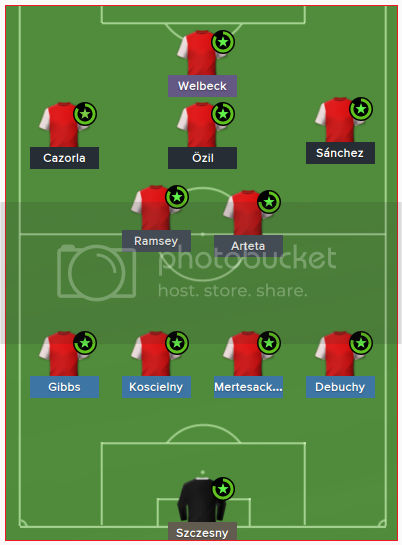 I have taken a look at my worst performers, no shock Ozil/Sanchez is there, but I am not sure if this is because of the sub appearances dragging it down. I would like to bring in a quality striker who can finish, regardless of age. If that means a 19 year old or 29 year old, they will come in to replace Giroud. Also would like another LW to replace Ozil, yes, I may sell Ozil (and Sanchez)... SHAME ON ME :o all hypothetical at the moment, looking through players now. 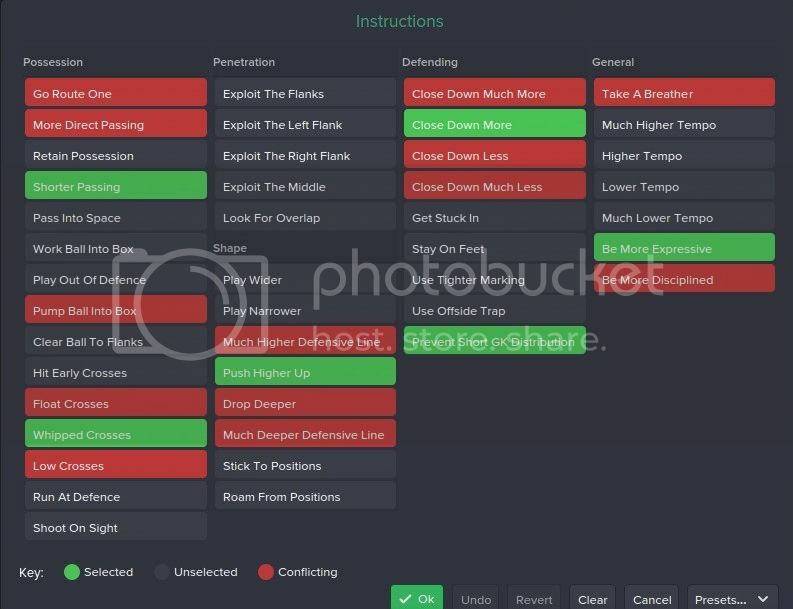 I am playing with an inside forward on support, but I don't want my save to feel and look like everyone elses I am weird like that. May give Ozil another shot this year, a full year with natural LW position. Looking at strikers, possibilities are Higuain, Aboubakar, Bacca and David Villa/Hunterlaar as last resorts Just want someone to put the ball in the net, we make so many chances. Champions League: Finished top of my group with CSKA Moskow, Kobanhavn and Sparta Prague. 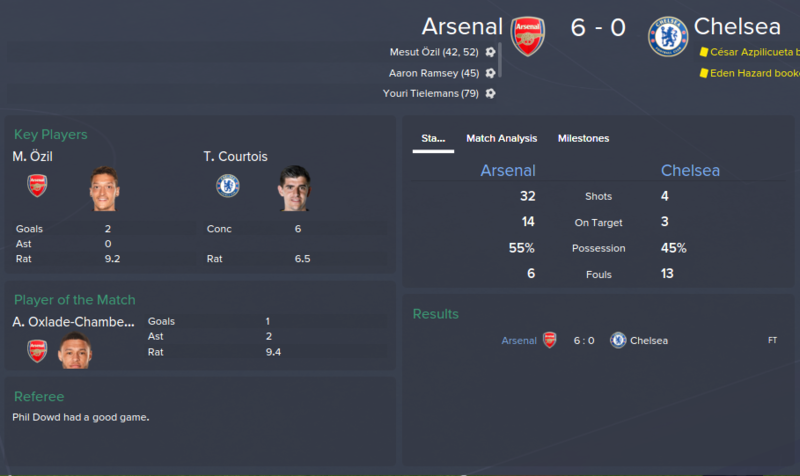 Got drawn against Ajax in the first KO round and beat them 5-1 on agg. 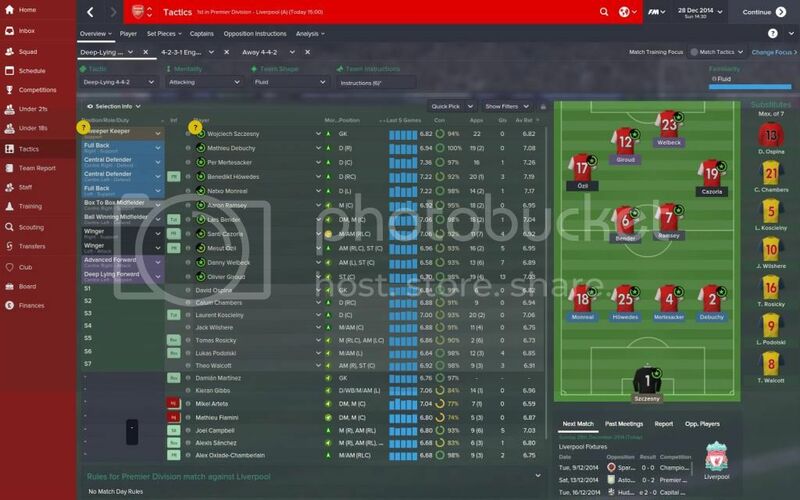 This got me a tie against Juventus who managed 4 goals against me at home, but lost 5-4, i won the away tie 2-0. Semi Final against the mighty Real Madrid, first match at home where they scored in the 47th minute in the first half and the 91st in the second, losing 3-2 to me, however they destroyed me at their home 3-0 and we crash out yet again They played Dortmund who beat Barca in the semi, with Dortmund winning it! League: Attempt number 4 at the league... and we won it! With one whole game to spare 4 points clear of Chelsea with 2 games left, an away game at Everton and a home match vs Man Utd. Beat Everton 5-1 after going 1-0 down, and drew with united 1-1. No-one better than Higuain at that. I'm sooo fed up with dominating and then losing due to 1 good action from the opposition. Welbeck and Giroud can't hit a barn door. It really drives me mad :s.
Also I keep conceding goals. It's been better with the new tactic but I keep conceding from free kicks, corners and crosses that can't seem to be intercepted. Yes indeed. Finished 6th in the league but wasn't fired, thank god. I think the problems may also have to do with signing too many new players. I do think I need a better goalscorer so I'm going to try for Munir, or Higuain. Munir is a lot younger but I don't know. Could just be in my game but I bought Munir with the intention of making him a shadow striker. I put him in the reserves for a couple of months and he's been awful there. 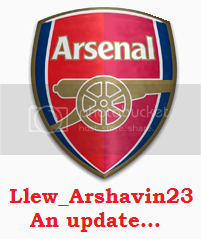 It's now May 2015, with Giroud, Carzola and Podolski leaving I might give him a few pre-season run outs but my impression is that I'll won't get by with Munir and Welback as my two strikers. Higuain looks good but I'm tempted by Jackson Martinez and his £20.5m minimum release. Welbeck has scored 30 in all competitions in 2014/15 but he's a liability in big games were there are fewer chances because about 75% of his shorts are off-target. Yes, precisely, Doumbia looks like a cheaper option as well. Have no experience with him though. Give Podolski a go in important matches if you still have him. He loves them on FM. Alas, Podolski is off to Roma in my game. He had a wonderful start to the 14/15 season scoring 12 goals before Xmas but declined rapidly thereafter. His last performance away at Man City was woeful: fell over the ball a few times, got booked for diving and was so far off the pace there was a danger he'd take root in the turf. Carzola declined in similar style during 14/15. Per and Arteta are also in serious decline but I think they still have a role for 15/16, both have accepted reduced squad status, Arteta was fine about me taking the captaincy off of him. He's now training to be a coach. No idea who to make Captain next season. Wilshire is too inconsistant, Per won't be starting as much, Balanta and Strootman haven't been there long enough. Maybe Ramsey or Ozil then. I bought Aboubakar to solve my finishing problems during the summer but he got injured for 3 months after an horrific start, and Welbeck has been amazing ever since. Half tempted to sell Aboubakar during the winter. Should of let him join Liverpool instead of us signing him, paid £20m so I should be able to get that back.